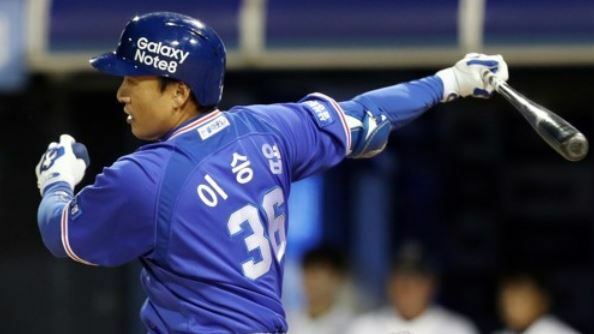 The final game for retiring South Korean baseball legend Lee Seung-yuop has sold out, his club Samsung Lions said Tuesday. The Korea Baseball Organization club said the 24,000 tickets to the regular season finale on Oct. 3 between the Lions and the Nexen Heroes at Daegu Samsung Lions Park in Daegu, 300 kilometers southeast of Seoul, have all been snapped up. The game will begin at 5 p.m. The first 15,000 tickets went on sale for the club's Blue Members on Sunday, and they were gone by Monday. Then the remaining 9,000 tickets were made available for all other fans at 11 a.m. Tuesday, and they were all sold within five minutes. Lee, 41, is leaving the KBO after 15 seasons here. He also played eight seasons in Japan's Nippon Professional Baseball from 2004 to 2011. He's the KBO's career leader with 465 home runs, 463 doubles and 1,495 RBIs. He also owns the all-time single season record with 56 homers from the 2003 season. Lee remains the league's only five-time MVP and also the only player to win the top individual award in three straight seasons, from 2001 to 2003.